On February 3rd during Sunday services, Gunipe and Grace gave 5 kg. bags of rice to 100 children in their main and two branch churches. These are children whose parents are seasonal laborers. This rice will feed their families for days. 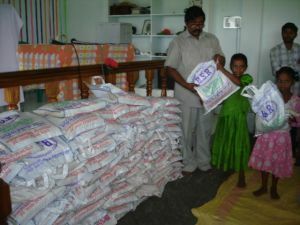 The Raju's ask that we pray for God's provision, that they will be able to give out rice bags to these children monthly.